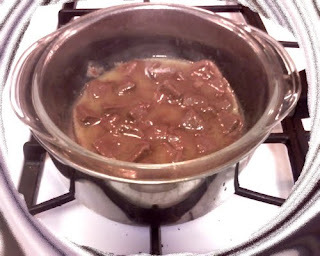 Melt Mars bar on stovetop (personally, I use the microwave – you just have to be careful not to melt it too quickly). Add margarine and mix until melted and smooth. 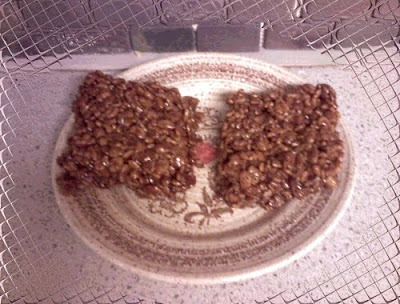 Pour over Rice Krispies and mix. Press in to pan, wait until cooled, cut in to squares and enjoy. They also freeze really well. This recipe can be easily doubled, tripled, quadrupled… entirely up to you. First, I want to thank Sarah, a customer at Blighty's, for sharing her grandmother's recipe. As always, I like to try every recipe before publishing it on this blog. Unfortunately, I don't have any fine imported British Mars bars in stock at the moment. Neither does our importer (the infamous Pugwash). So I had to make a substitution. I used a 230g bar of impported British Cadbury Diary Milk chocolate instead. I melted the chocolate in a special double boiler that I have used before in these recipes. It is simply a pyrex dish that fits neatly into the top of a saucepan. The chocolate is melted by the heat of the steam from the boiling water in the pan. Sarah: I promise to try the Mars bar version as soon as I can get more of them in stock!